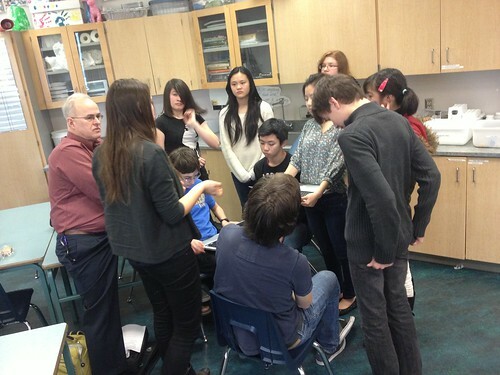 As part of the ongoing assessment of personal and collective learning that went into the class’ study of Canadian Confederation, TALONS learners were asked to reflect on their quad’s presentation & facilitation of a discussion topic pulled from the unit, taking into account the Nine Dispositions of Democratic Discussions. As with many of these sorts of assessments / reflections in our classroom, the reflection was built around the familiar Stars (things that went well) and Wishes (things that we would like to improve). I think that something our group did very well at was providing a level of comfort within the talons classroom. Almost everyone participated; even those who normally just listened. I think this was because people were no longer afraid of sharing their opinions in the classroom, as they had a solid fact to base them off of (what was written on the red piece of paper). Also, I think that people were able to fill the shoes of the type of Canadian that they had to portray in the card that they were given. Therefore, people were not only able to participate, but they were able to effectively adopt a new viewpoint on the grievances too. During our group discussion synthesis, the disposition that I felt was best emphasized was that of mindfulness. I felt the groups communicated well within its members to discuss relevant topics. They helped each other put forth ideas discussed by the group when necessary (the hospitality present was also well-emphasized). When debating inter-group topics, people stayed on the topic that was being discussed and presented arguments to benefit the outcome of the conversation. People were mindful of the importance of each idea, and would debate that instead of ignoring ideas and putting forth their own points. As I was overhearing group discussions, I also felt that members within each group were willing to give everyone’s ideas thought and time. The disposition that I thought I was particularly successful at was participation. I felt that the task we got the class to do encouraged everyone to participate. My quad and I separately circulated around the class when the groups were instructed to discuss what group they would vote for, to answer any questions if necessary and to direct the conversation to somewhere the participants would benefit. When I went around to all the quads, I tried to push to help develop ideas in the quad discussions. To do this, I asked questions to generate more thought-process, and tried to direct the conversation to people who generally participated a little less. If needed, I would rephrase ideas and statements, and clarify the differences between the many parties. …as an individual, I feel that I did an acceptable job in the disposition of humility. When playing as “Canada” against “Britain”, there were often moments in which our quad could not argue back against Britain. Even though I did not openly concede that they had brilliant points, I realized our position in the debate and accepted their excellent arguments with peace. In general, I think the one disposition that I had throughout all our discussions was hope. Now, this may be one of the less popular ones people talk about, and it is also the one that many forget about sometimes. Like I’ve mentioned before, this unit was a difficult one for me. I struggled with participating in class, and grasping many concepts of the Confederation, but I never let that get me down. I knew that, somewhere at some time, whether it was the next day or a week later, I would improve on these aspects. I welcomed improvement and failure, and made more room for myself to grow. I built faith in myself, and hoped that my strengths and perseverance would pull through in the end. In my opinion, they did. One of my strengths that I have shown in this presentation was deliberation. Even when we taught and moderated the discussion in the classroom, I always took my thoughts that I had gathered during our teachings and shared it with others before and after, even writing it down to reflect on. During the debate in our presentation, I didn’t moderate as much as I may have been supposed to, but I was always mindful of questions and problems that others had brought up, and I communicated answers to others helping moderating our debate. Appreciation: The main reason why I feel like I excelled in the disposition of appreciation is because with our activity of forcing the class at large to take on the role of Britain and defend our quad’s accusations of them mistreating the Canadas. With this unique role bestowed upon the class, it forces them to think in a completely different perspective, and puts them into the rarely worn shoes of the antagonist. (Though really, the “antagonist” is subjective; in this case because we’re learning Social Studies in Canada, we see us being mistreated by the British.) With this unique role, the class was able to not only in the position of Britain, but also appreciate their point of view and come up with convincing and unbeatable arguments against Canadas’ grievances. Some things I feel I need to work on are Deliberation and Appreciation. The specific aspects of Deliberation that I feel as though I need to work on are seeing other`s viewpoints and not just my own. I find myself often driven to reach a consensual opinion about any given topic, especially one that is detestably controversial as topics often are in the TALONS`social study classes. This point is a nice seg-way into my next point which is that I feel my appreciation for class opinions could be improved. I love hearing about the opinions and different view`s of my peers, however I do still find it somewhat frustrating when someone (or a particular group of people) cannot see that my way is the right way. Something I think that I could work on is definitely nurturing more mindful thought through our discussion. Although we went through a lot of concepts, I didn’t really stop the conversation to ask “why?” One example is talking about immigration. Although we understood that Irish and Scottish migrants came to British North America because they disliked the class system, I could have connected that to the class system in Canada at the time and how it was very similar. What I think I could improve on was Hospitality. It really is difficult to be hospitable when having a debate with someone…. The whole point of a debate is to argue against the other person. However I feel as though I could have been more hospitable and in turn, this could have helped fostered more discussion. This might have also helped some of the quieter people to join into the conversation because they wouldn’t be intimidated by the fast pace that the debate took. Hospitality: Although initially I tried my best to remind the class to let people who haven’t talked as much do some talking, once the debate got underway and got heated, it was back to the loud people making all the points back and forth. I didn’t create a very hospitable environment for the more timid people to jump in as points were being fired back and forth both rapidly and furiously, which would probably cause people to shy away from talking for fear of being shut down. I feel I lack in deliberation, always really stubborn with my views and thoughts on things. It’s hard to change my mindset when it’s already fixed on one thing, and it’s a bit of a one-way track in that sense. I’m proud of it sometimes, if only because I know my principals and moral code are set in stone, however; it makes learning things I know even the smallest bit about a teensy bit harder. A disposition that I could have improved on, as an audience member and as a discussion leader is deliberation. I didn’t stop to think more about ideas that could have been branched off and elaborated on. I would just think of an idea, and feel like I was done. It’s almost as if I would do only half the work in my head and believe that I would finish the idea later. However, I think this also improved as I gained more experience with discussions. I would walk into class, being so sure of something, and then one of my quad members would say a completely different point that would make me reconsider my take on the subject. I found that I could learn a lot from my classmates, and I think the people around me have played a part in my improvement as well. I think that hope is a subject that I need to work on. This is a reflection, so I’ll reflect on both our class and the rest of the week. Hope represents, to me, the hope to progress in work and become better. I probably need to work on that in the sense that I need to encourage others to do it more. While I may not be the best candidate to explain how or why people don’t try to exceed, I felt that during the week, in general, people didn’t stray outside their comfort zones. Those who didn’t were okay with giving the same amount of participation over the course of the week. I wish I could say I knew how to encourage people more, but I don’t. So, while I can try and do this more, I’m not quite sure how successful I’ll be. Of course, there is always the awkward truth of the matter that there’s only so much one person can do.